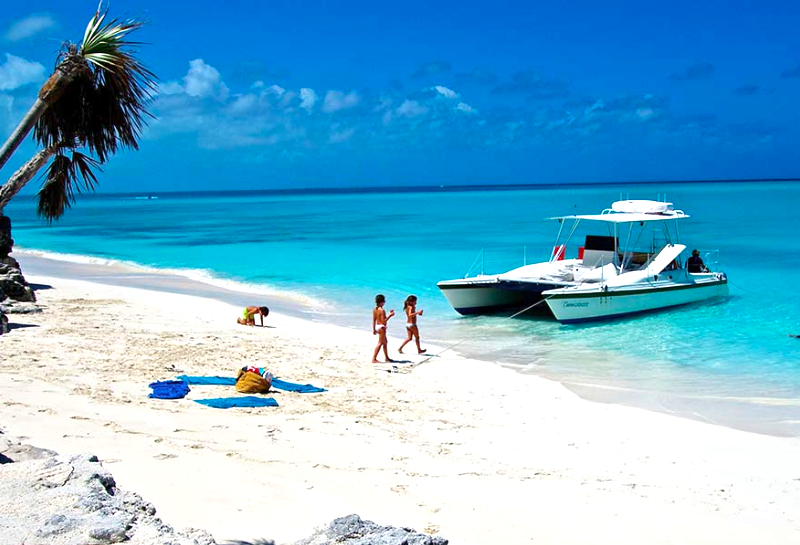 People come to the Turks and Caicos for our unbelievable beaches and crystal clear blue and turquoise waters. We have the third largest barrier reef in the world that protects our chain of islands and creates perfect tranquil waters for just about all watersports enthusiasts. We get asked a lot about who to go out on the water with and so without further ado, here is a list of our favorites and what they offer. 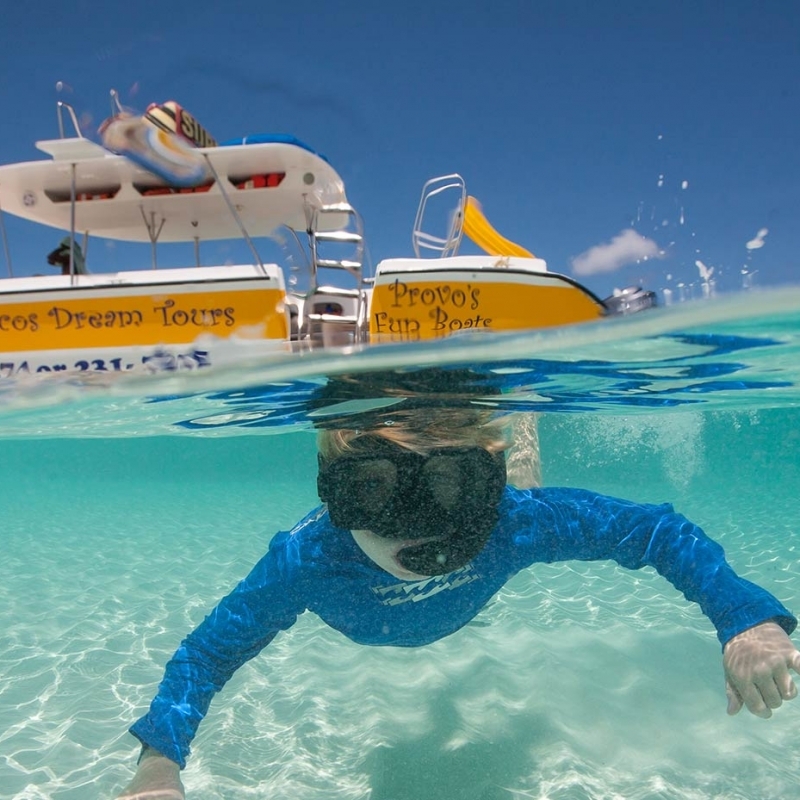 Like most of the boats here, Caicos Dream Tours offers both public and custom private charters ranging from both 4 hour half day cruises to 8 hour full day cruises. They offer conch diving, snorkeling the reef, beach hoping, iguana island tours and bottom fishing. What sets these guys apart from other tours is how they cater to families with young kids; there are water slides, diving boards and tubes on board. Rates start at $90 per person plus tax to join a public trip and $1100 plus tax for a four hour private trip. 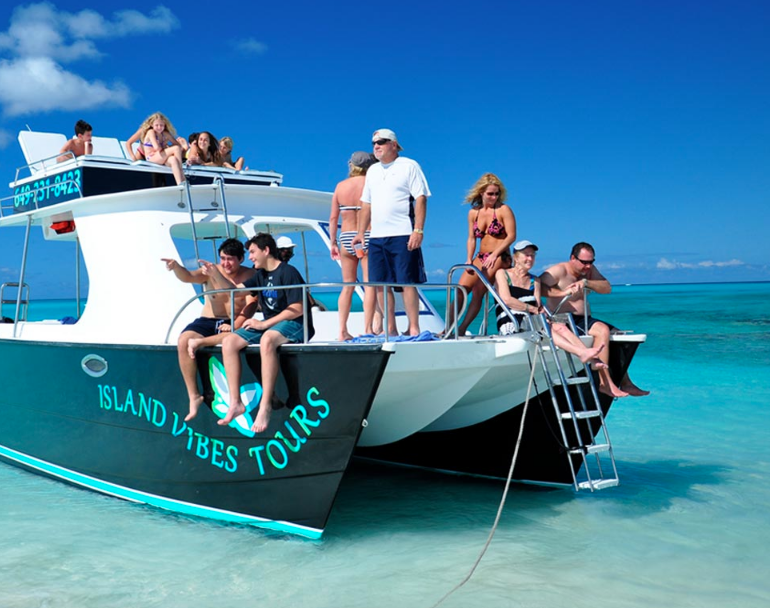 Island Vibes offers full and half day casual boating, parasailing, luxury boating options, beach lunches, bottom fishing and snorkeling. They even offer shorter sunset tours. Their boats consist of multiple power catamarans (as pictured) and a luxury mono-hull option call Hakuna Matata. As mentioned they also offer parasailing. Fly 500 feet above the Caicos blue waters and get the bird’s eye view of the islands. Atabeyra is the charter boat with the longest standing history in the islands. It was built by the boats current owner, Dave and sailed down to TCI from the USA. This 69’ schooner was once a rum runner in the 90’s that used to trade with Hispañola. Since the 90’s, tourism kicked off in the Turks and Caicos and naturally, the Atabeyra started offering public and private trips here in the islands. The Atabeyra has a very shallow draft in the bow which allows this vessel to comfortably and easily pull up on any beach. It’s 69’ length offers the most deck space of any rentable sailing vessel in the islands and it’s crew are some of the best. Beluga is a smaller and intimate 40’ sailing catamaran. For its size, there is plenty of deck space. This boat has been sailing the waters for long time and just like the Atabeyra, Beluga was originally built by its current owner and captain, Tim. 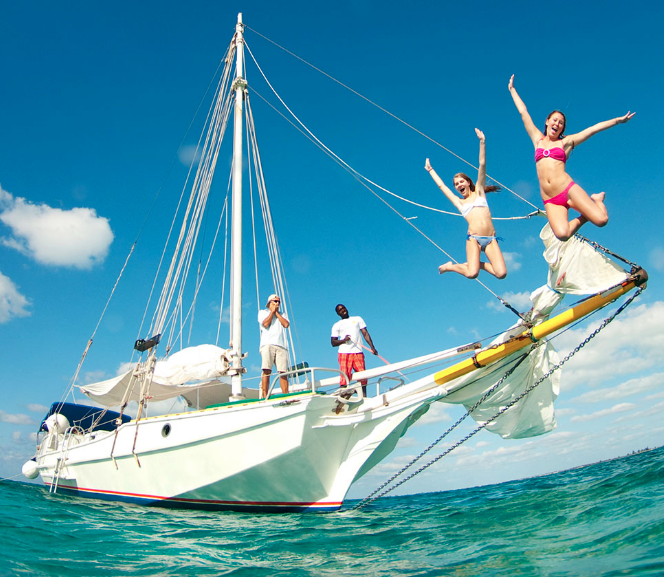 Beluga offers full and half day cruises, sunset cruises, snorkeling trips and beach escapes. 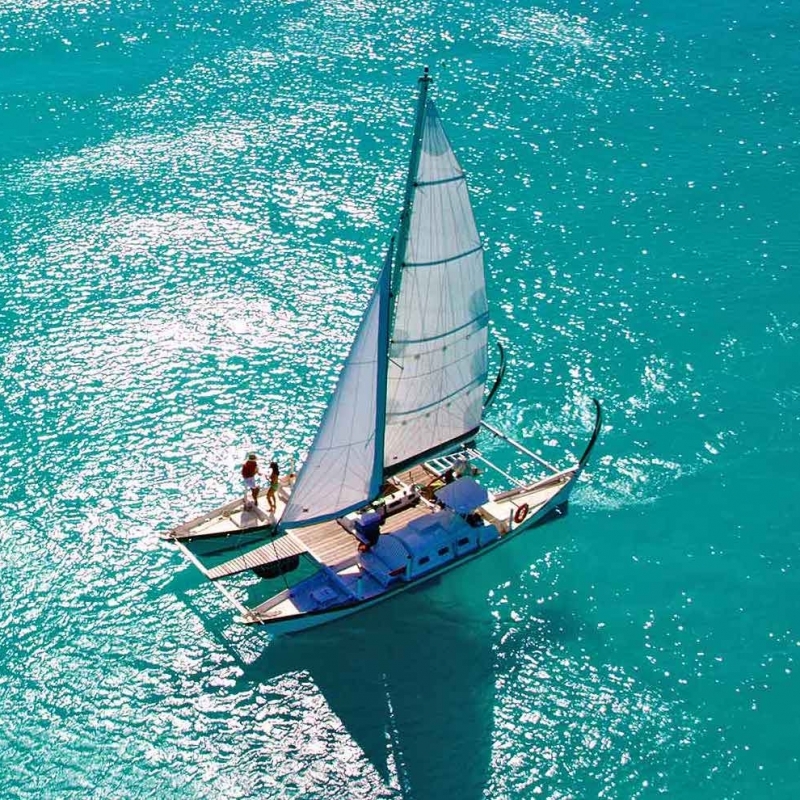 Big Blue Unlimited is a multi faceted watersports and eco company that offers private charter only boating, working with smaller groups of guests and catering each experience to each guest’s level of experience. Big Blue offers scuba diving certifications, private scuba diving trips, snorkeling, exploring some of the other islands (by boat and land), kayaking, paddle boarding and kite surfing. They have a fleet of boats and a large team to that specialize in all of the above mentioned sports. Matt Slattery runs a very cool converted power catamaran that used to be a sailboat. ‘Caicos Catalyst’ draws very little water so they are able to get in and out of spots most other boats can’t. As the boat is a Catamaran there is also a lot of deck space and comfortable loungers under a large shade. This is a perfect boat for a slow cruise family full or half day on the water. Caribbean Cruisin is based in Blue Haven Marina on the East end of Provo. 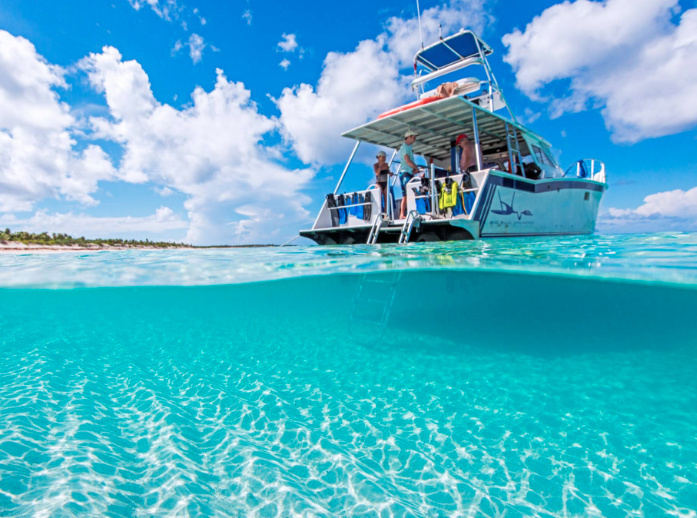 Caribbean Cruisin offers the island’s only ferry service to some of the neibouring islands like North Caicos and South Caicos but also an array of land and sea excursions. 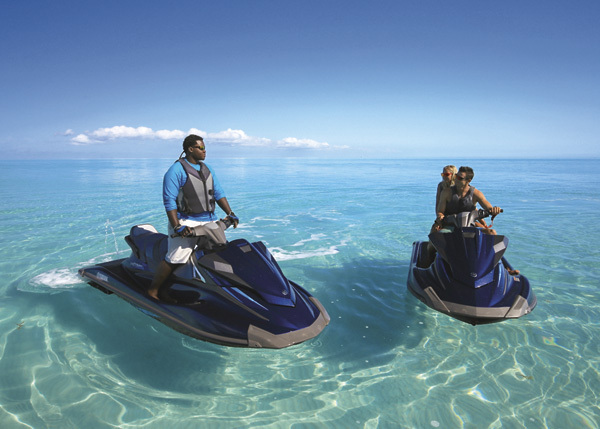 They offer large and small captained boats as well as jet ski tours.